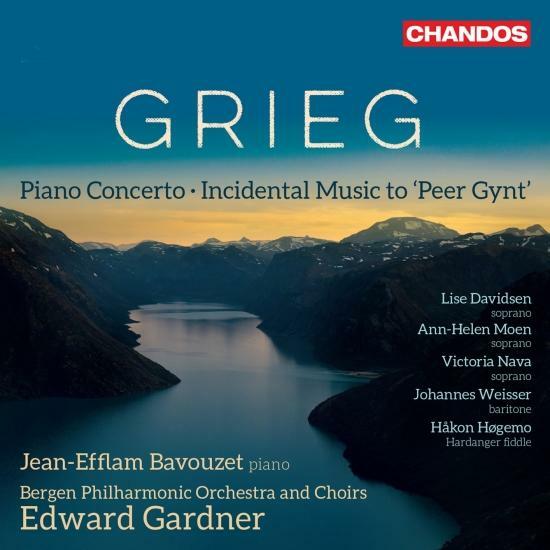 This much awaited recording offers keenly idiomatic performances of the most famous works by Grieg, played by the composer’s own orchestra, the Bergen Philharmonic, and its Chief Conductor, Edward Gardner. The drama and passion of such favourite pieces as the incidental music to Peer Gynt and the Piano Concerto are superbly captured in surround-sound with exemplary Chandos sound quality. Unlike most existing recordings, offering only the orchestral suites, this disc presents numerous extra excerpts from Peer Gynt, which follow the sequence of Henrik Ibsen‘s dramatic poem, including sections for the unique Norwegian 'Hardanger Fiddle’. Having collaborated with the orchestra on several occasions, Jean-Efflam Bavouzet is the soloist in the Piano Concerto, a piece that stands out as a shining example of a single great thought captured and expressed in music. The power of this conception is evident throughout the concerto in the pianist’s faithful, yet highly romantic interpretation. 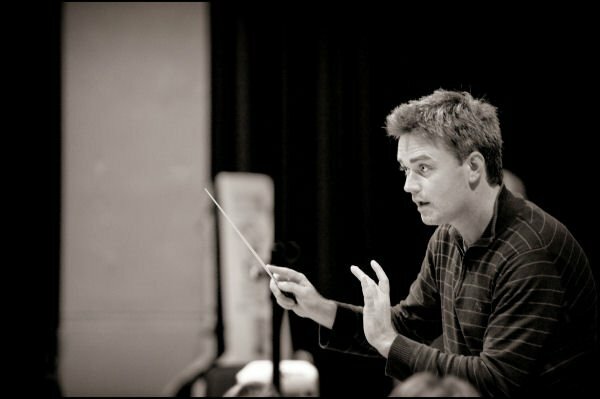 Recognised as one of the most talented conductors of his generation, Edward Gardner began his tenure as Music Director of English National Opera in May 2007 with a new critically acclaimed production of Britten’s Death in Venice. Under his direction, the ENO has presented a series of stellar productions, including Boris Godunov, Cavalleria Rusticana & Pagliacci, Der Rosenkavalier, Punch and Judy, Peter Grimes and most recently a double bill of The Rite of Spring and Bluebeard’s Castle. In recognition of his talent and commitment, Edward received the Royal Philharmonic Society Award in 2008 for Best Conductor and this year, the Olivier award for Outstanding Achievement in Opera. Equally successful outside ENO, Edward’s future operatic engagements include debuts with Lyric Opera of Chicago, The Metropolitan Opera New York and La Scala, Milan. A regular at Paris Opera since 2004/5, Edward’s most recent production there was Stravinsky’s Rake's Progress in 2007/8. In 2008 Edward returned to Glyndebourne Festival Opera with a production of Britten’s Turn of the Screw.Since making his successful debut in 2005 with the BBC Symphony Orchestra at the Aldeburgh Festival, Edward has been re-invited each year to the orchestra and in 2008 conducted the UK premiere of Saariaho’s Adriana Mater in concert at the Barbican as well as making his Proms debut. Edward works regularly with the Halle Orchestra, the City of Birmingham Symphony Orchestra and the Orchestra of the Age of Enlightenment in the UK. Internationally, he works with the Bamberg Symphony, Gothenburg Symphony, Bergen Philharmonic, Trondheim Symphony Orchestra, Melbourne Symphony, Saint Louis Symphony Orchestra, NAC Ottawa and the Indianapolis Symphony amongst others. In 2009/10 he will make his debut with the NHK Symphony Orchestra and Netherlands Radio Philharmonic Orchestra and return to the BBC Proms. 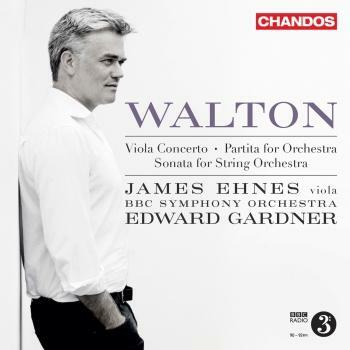 Future seasons include the Philharmonia, London Philharmonic and Rotterdam Philharmonic.Edward has signed an exclusive contract with Chandos Records from 2009 with plans to record 2 discs per season. He has also made a number of recordings for EMI Records; Alison Balsom/Gothenburg Symphony Orchestra; Kate Royal/the Academy of St. Martin-in-the-Fields and Kate Royal/English National Opera Orchestra.Born in Gloucester in 1974, Edward was educated at Cambridge, and the Royal Academy of Music where he studied under the instruction of Colin Metters. He graduated in 2000 and went on to assist Mark Elder at The Hallé Orchestra for 3 years before being named as Musical Director of Glyndebourne Touring Opera in 2004, a position he held for 3 years. The BBC Symphony Orchestra has played a central role at the heart of British musical life since its inception in 1930; and (as the flagship orchestra of the BBC) it provides the backbone of the BBC Proms with at least a dozen concerts each year including the First and Last Nights. The BBC SO has a strong commitment to 20th-century and contemporary music—recently it has given world premieres of BBC commissions by leading composers such as John Adams, Elliott Carter, Brian Elias, Vic Hoyland, Matthias Pintscher, Karlheinz Stockhausen, and Judith Weir. The 2009–10 season included commissions and premieres from Ian McQueen, Bill Frisell/Mike Gibbs, Ryan Wigglesworth and Peter Eötvös. Jiøí Bìlohlávek took up the post of Chief Conductor in 2006 and he and the BBC SO perform together frequently across the season both in the UK and internationally. The orchestra also works regularly with Principal Guest Conductor David Robertson, Oliver Knussen, recently appointed Artist in Association, and Conductor Laureate Sir Andrew Davis.